Each chapter has 4 levels with 2-3 stages each, with a couple also having bonus stages. Later chapters tend to have more missions per node. I wanna say maybe around half an hour to complete a chapter? Mind I've only cleared Chapter 1 thus far. 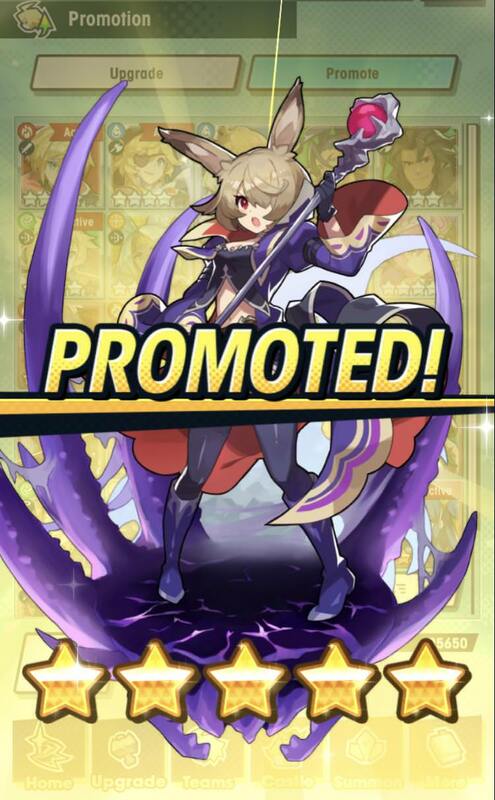 Also I got lucky and got a 5-Star character _and_ a Dragon I really wanted with the 10 summon deal, though I've been sticking with the "story" characters thus far. Also damn it I love how lively the menu is even if I know it must be obnoxious to some. But the cute music, combined with the images of your character treking along, with the people you've recruited chiming in with their lines, occasionally switching to shots of camping or staying an inn, really gives it a fun, adventury feeling I find oddly nostalgic. I feel like one of the difficulty spikes is from Chapter 5 to 6, or it could be because my two main characters are light and shadow type and I have been neglecting the other elements. Do we know what type of unit the free one from the upcoming event will be? I ask because I need more Shadow and Wind units badly, and I like playing archers the most by far. Also, I finished the main story. Holy Difficulty Spike Batman, those Imperial Defense maps are pretty much impossible without co-op. Yes, there's a notable difficulty jump after chapter 5. It's not just you, a lot of people feel that way. Also, current speculation is that the event character is Water with a sword or a katana. I guess there's an image of her somewhere? I dunno. This seems interesting. Where can I download this game? On your phone. The iPhone app store or the google store on Android, I think? Nvm seems I can download the app that will download Dragalia Lost. Anyways, been trying to play this game. How was it? I'm going mad... surely the Fire-type Imperial Defense must have any stage hazards? Am I'm just crazy or my game is bugged? SURELY IT HAS HAZARDS SOMEWHERE! Stamina seems pretty generous, and getherwings/online play help when yer stuck "almost" leveled up. Max getherwings are 50 so prioritize using them up down to 44 wings over draining stamina. Kewl. Think I will try to be active in this forum and give my thoughts on the game. But first... Anybody had a tutorial when playing the game esp. When it comes to rerolling? Unless you're crazy about rerolling, I'd recommend just aiming for any 5* character or dragon (or both). There are no bad 5* of either of those, at least not in a way that has become apparent in less than a week. In terms of 4* pulls, keep an eye out for Phoenix (a fire dragon). It's basically the only big heal for non-healer characters, so it has unique utility at the moment. As for the hows of rerolling, I didn't do it so I don't know personally, but I hear people say rerolling is a lot faster on an emulator. You could just google it. Right. Whats the summoning currency that you will use for Dragalia? Wyrmite. That's not really something you need to ask before playing though, is it? There's an in-game tutorial for this sort of thing. There's also diamantium but that requires money and if you're rerolling, summon vouchers likely won't be an option. Whoops. Sorry to ask that. Anyways, gotta play this game at a later time and give my thoughts on it. I'm still a low level nub. Decided to use that free ten summon voucher in a token attempt for Lily and got Nefaria and Poli'ahu. You seem to get friendship proportional to the stamina cost of the run, plus a bonus for doing the special event missions. So the best place to get loyalty is probably the raid, honestly. Luckily Celliera is actually a pretty good character. Stupid question. But is it alright to link the DL account to your Nintendo Account at a later time? I don't think you have to link it immediately. When people reroll, they usually save linking for after they find a start they're happy with. Linking basically just saves your data in the Nintendo cloud. Man, I'm lucky today. After no 5* adventurers before, I got both Lily and Hawk. Anyway, raiding with randoms is pretty frustrating. You've got people who refuse to play with you in the lobby because your team is only 6.5k even though it's four water DPS with a Phoenix and Leviathan and kitted out with the raid prints, it takes an eternity if you open your own lobby, and most frustratingly I had a host who ended the raid after losing one character, even though all three of the rest of us were untouched and making good progress. I've heard people end Co-Op if anyone dies so they can clear it and get all the achievements for the level. As for raids, I've seen people in the subreddit saying that anyone with a team/character with less than 8k Might not being worth playing with and it seems to be a popular sentiment. That said, does completing the Raid story guarantee you the event characters or do you have to earn them through event currency? Asking because I've done a bit of the start of the event but not much. Just keep playing quests with the event character in your party until her gauge fills up. I'm honestly still a bit afraid to try co-op in this game, much like how I still haven't bothered with the multiplayer content in Granblue. I'm pretty self-concious about my own performance and feel like I'd make too many mistakes to make co-op worthwhile, though unlike GB I do plan to get around to it eventually. Plus, I'm still clearing main story content (in both titles and Grand Order, for that matter), and I don't know if I'm raising my characters effectively at the moment (I just ran into a mana deficiency problem and just realized that I'm probably spreading myself too thin on resources right now). Despite all that, I am finding the game quite fun, though I still lack a five star character (I have recently got Poseidon as a five star dragon though).